Need to build a small fully featured desktop system? Maybe you want to get the most bang for your buck from a DIY Steam Machine. Well the latest case announced by Cooler Master may be just the thing you’re looking for. The Elite 110 promises to be the most compact fully featured MiniITX case available. In its small footprint, Cooler Master has managed to make sure most of your bases are covered with the Elite 110. The front features a fully breathable mesh with room for a 120mm fan and all-in-one water cooling. The intelligent use of internal space in the Elite 110 continues with the ability to accommodate mid or high end video cards up to 210mm in length. Should you need a beefy power supply to provide volts to everything, there is also an extended bracket to allow a PSU up to 180mm long. This makes the case versatile enough for a swap from ATX to mini-ITX with just a change of motherboard for most mid-range gaming systems. Pricing and availability was not released with the press release below. However, Futurelooks did interview them at CES 2014 and found out that they are targeting a $49.99 US price point and it should be out by the end of the quarter. Our coverage video is coming up shortly so make sure you come back. 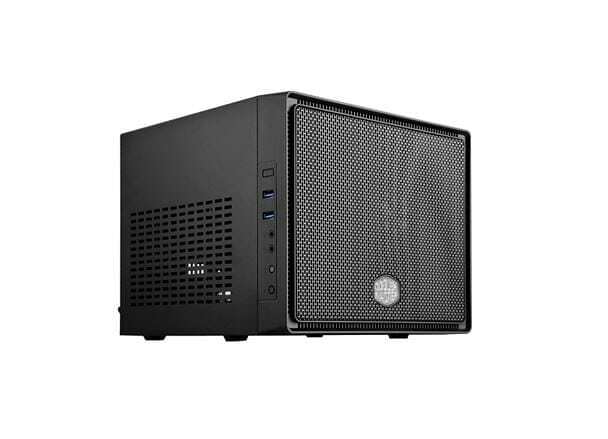 Chino, California – January 8th, 2014 - Cooler Master, an industry leading chassis, thermal solution, peripheral, and accessory manufacturer, to releases the Elite 110 mini cube compact chassis in North America. Elite 110 is the most compact fully featured Mini-ITX chassis. A full breathable mesh front panel holds space beneath it for a powerful 120mm All-in-One watercooling radiator. Elite 110 Mini Cube is engineered to fit in the minutest spaces while maintaining support for premium hardware. A pleasing, conservative design helps Elite 110 blend into any home environment. Offering no compromises, Elite 110 is built with an intelligent use of internal space. Mid to high-end graphics cards up to 210mm long can be accommodated easily. A simple, yet effective rear PSU bracket allows Elite 110 owners to easily install long power supplies up to 180mm long. Despite its miniature size, Elite 110 can support a full three hard drives or four SSDs. Elite 110 Mini Cube features full force cooling with its included 120mm front intake fan (compatible with 140mm fans), and 2 x 80mm optional side fans. Users needing quick access to ports will find a rich front I/O panel with two Super Speed USB 3.0 ports and audio in/out. Elite 110 is available now. Price and availability may vary by region. This release is for North America region(s) only. Please consult your local Cooler Master Representative for more information. Click here for more details on the Elite 110.